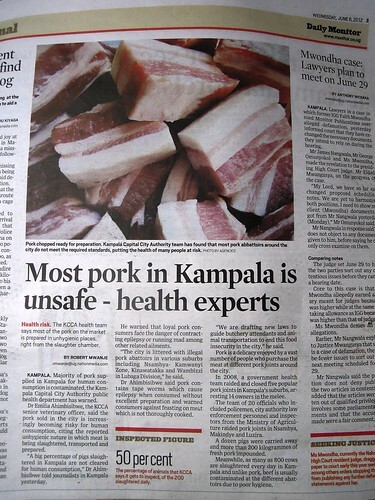 An article in Uganda’s Daily Monitor newspaper (6 June 2012) reports that a senior veterinary officer with the Kampala Capital City Authority (KCCA) has warned that most of the pork on sale in Kampala is prepared unhygienically and, thus, is unfit for human consumption. 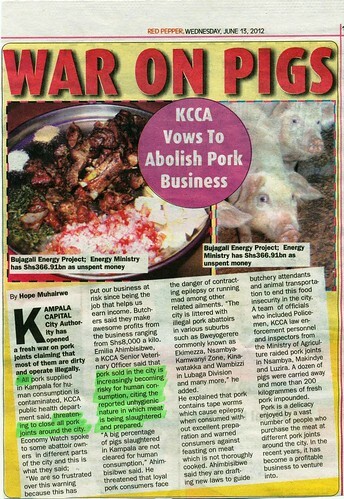 Another article in Uganda’s Red Pepper (a more popular paper) on 13 June 2012 even declares ‘war on pigs’, communicating that KCCA threatens to close down all pork joints in town. Some of the statements in both articles are very strong and trivializing. Are ‘loyal pork consumers’ per se at risk of ‘running mad’ from eating pork? What is contaminating the pork and what are the odds of these contaminants reaching the consumer? What are the consequences of eating ‘contaminated’ pork… diarrhoea for one day or a life-long disability? The risk-based approach of the Safe Food, Fair Food project aims to find answers to these questions. Eventually, we will be able to communicate evidence from research instead of incomplete and panic-stirring statements and thus help to promote the pig sector instead of banning it. Tags: media. Bookmark the permalink.